Mixed media project using clay, paint, pencil, crayon and watercolor. This would be best for 6+ with assistance. It will require 2-3 days to finish. Read My Rainbow Fish Book Box or read books of your choice about fish. This would also be a great culminating project for a unit on fish or an exploration into mixed media. See more of our suggestions below. Talk about parts of a fish and show a lot of pictures to help give ideas. Talk about the head, tail, fins and the different shapes and sizes. 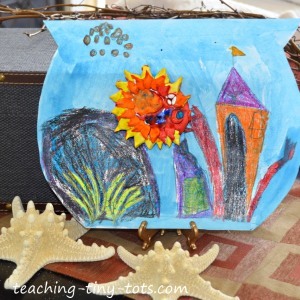 Having children draw and plan their fish on a piece of paper can be helpful as well. If this is for a group of children have labels or masking tape ready to put their name under the fish. If you have access to a kiln, using the appropriate clay will also work well. The Crayola air dry clay is NOT made for a kiln. 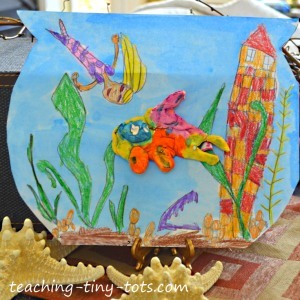 Print the fish tank on white construction or water color paper. Have children draw the inside of their tank. If you have a few sample plastic plants or aquarium decorations, this is helpful for children to get ideas. Or search the web for pictures to help generate ideas. Draw your scene using a pencil and then coloring with crayon. Advise children to color evenly and a little heavy for best results. Using blue watercolor paint, paint over the fishbowl scene. Let dry. 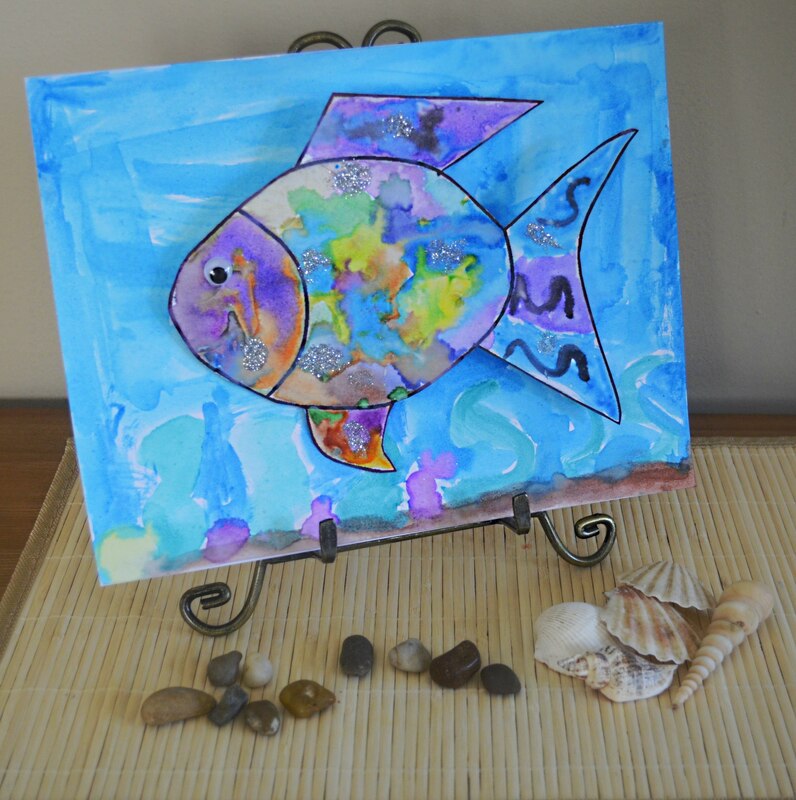 After your fish has dried completely, paint with tempera or acrylic paint. Let dry. Using a glue gun or craft glue like Aleene's Quick Dry Tacky Glue or similar to glue fish onto your fishbowl. From the Crayola website it says: Water can be added to Air-Dry Clay to soften or join pieces. If too much water is added and clay is very soft, allow excess to evaporate before molding pieces; otherwise, cracking may result. When working with Air-Dry Clay, remember that pieces greater than ¼” thick are more durable and less fragile than thinner pieces. When joining two pieces together, score or roughen both surfaces, then apply slip before pressing firmly together. To make slip, mix together clay and water until it's the consistency of heavy cream. You can use acrylic, tempera or watercolor paint on the Crayola Air Dry clay when it is dried. Cute rock fish are a perfect culminating activity for a fish unit.